Harry Potter is a series of seven urban fantasy novels written by British author J. K. Rowling. The series chronicles the life of a young wizard, Harry Potter, the titular character, and his friends Ron Weasley and Hermione Granger, all of whom are students at Hogwarts School of Witchcraft and Wizardry. The main story arc concerns Harry's struggle to kill the Dark wizard Lord Voldemort, who aims to become immortal, overthrow the government of wizarding Britain, subjugate non-magical people, and destroy all those who stand in his way. Since the release of the first novel, Harry Potter and the Philosopher's Stone, on 30 June 1997, the books have gained immense popularity, critical acclaim and commercial success worldwide. They attracted a wide adult audience, and have remained one of the preeminent cornerstones of young adult literature. The series has also had some share of criticism, including concern about the increasingly dark tone as the series progressed, as well as the often gruesome and graphic violence depicted in the series. As of May 2015, the books have sold more than 450 million copies worldwide, making the series the best-selling book series in history, and have been translated into 73 languages. The last four books consecutively set records as the fastest-selling books in history, with the final installment selling roughly 11 million copies in the United States within the first 24 hours of its release. A series of many genres, including fantasy, drama, coming of age and the British school story (which includes elements ofmystery, thriller, adventure, horror and romance), it has many cultural meanings and references. According to Rowling, the main theme is death. There are also many other themes in the series, such as prejudice, corruption, and madness. The series was originally printed in English by two major publishers, Bloomsbury in the United Kingdom and Scholastic Press in the United States. The seven books adapted into an eight-part film series by Warner Bros. Pictures, which is the second highest-grossing film series of all time as of August 2015. The series also originated much tie-in merchandise, making the Harry Potterbrand worth in excess of $15 billion. Because of the success of the books and films, Harry Potter-themed areas, known as The Wizarding World of Harry Potter, have been created at several Universal Parks & Resorts theme parks around the world. 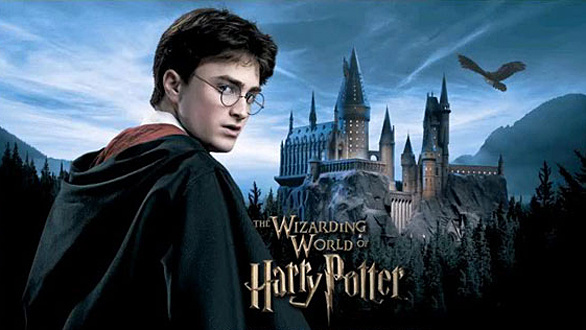 The franchise continues to expand, with numerous supplemental books to accompany the films and the original novels, a studio tour in London that opened in 2012, a traveling exhibition that premiered in Chicago in 2009, a digital platform entitled Pottermore, on which J.K. Rowling updates the series with new information and insight, a sequel in the form of a stage play, and a trilogy of spin-off films premiering in 2016, amongst many other developments.